The Labor Movement is back. This may look absurd, and rightly so. 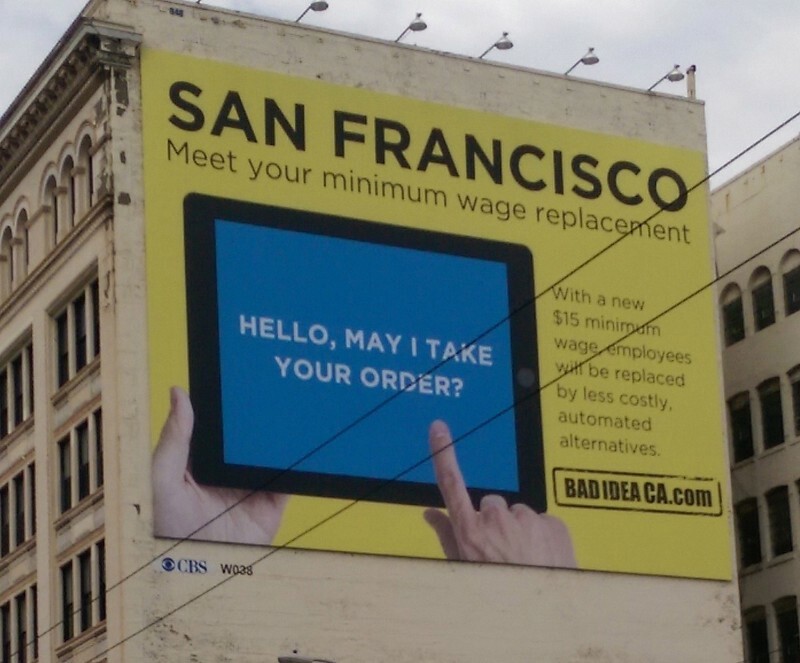 The idea that people should be forced to sell their labor at the threat of being replaced by robots, and in response call for the right to better pay instead of the right to be replaced by said robots is kind of absurd, isn’t it? Because, what exactly are robots for anyway? Technological advancement is the boon of human progress, not its bane. Whereas once over 90% of human labor was dedicated to agriculture, in the U.S. it is now 1.1%. What if we had looked at the tractor in fear of it reducing the need for our labor? Where would we be now? We must not be fooled however into thinking that just as agricultural labor moved to manufacturing, and manufacturing is moving to service industry labor, that service industry labor will be safe or move to something else again entirely. For this is no longer about tractors replacing human horsepower, but hardware and software replacing human brainpower. Still believe there is nothing to worry about and everything will be okay? We need to understand and comprehend this ongoing replacement of human labor. It will not be stopped, nor should it. Humans need to sleep. Humans need to eat. Humans are slow. Humans make mistakes. Humans get bored. Humans take time to learn. Humans require wages and salaries… and that right there is the biggest issue of all. There are already instances where it costs more to pay a human than to buy a machine or make use of an app. This point is even being reached in places of exceedingly cheap human labor like China, where even Chinese workers are now being replaced. 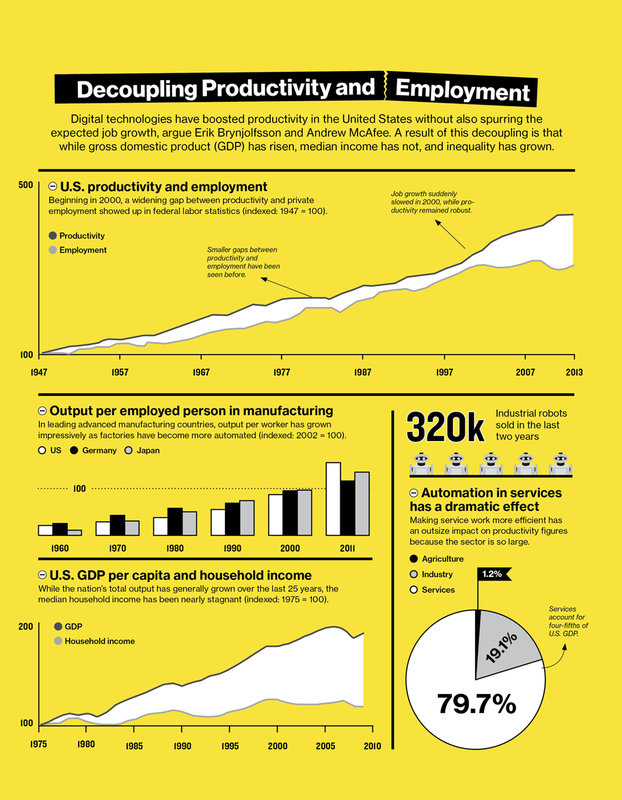 However, instead of openly embracing this accelerating automation, wage laborers tend to fight against advancing technology for fear of losing jobs, because again, humans are the ones who need wages and salaries, not machines. Why not? Shouldn’t saving labor be technology’s entire focus? It certainly seems so, but we would all rather eat than watch robots do our work for us as we starve. 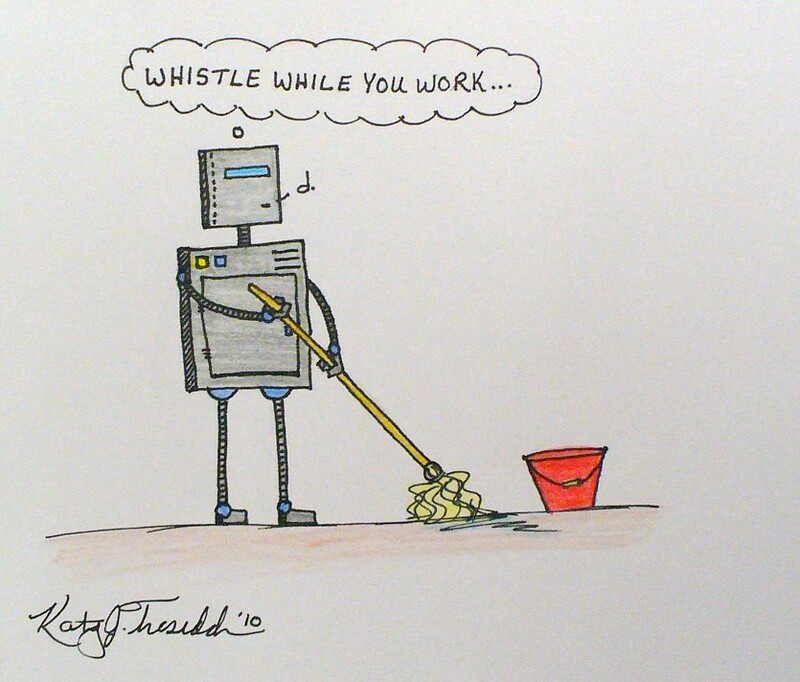 But we could eat and watch robots do our work for us as we thrive. By forcing the false choice between the two instead of embracing both, we push against human progress, just as if we had pushed against tractors on farms. A large increase in the federal minimum wage would mostly only help those at the very bottom of the labor market, leaving out in large part the great majority above the very bottom and all the unemployed denied access to the labor market entirely. Meanwhile, the increase in mandatory labor costs would only serve to increase automation in a way that only increases inequality. Owners of capital would come to own more capital, and those without capital would find it even harder to sell their labor at all. Another group of workers a minimum wage does little to help are those increasingly employed within the “gig economy”, where people aren’t actually employees for companies like Uber and Lyft or TaskRabbit and Fiverr. Instead they are just earning microwages as independent contractors precariously gaining $10 here and $5 there from gig to gig, with nothing remotely close to being definable as job security. These are people who labor economist and co-founder of BIEN, Guy Standing has dubbed the “precariat” — the growing class of people who live day to day, never knowing if they will be able to earn enough to meet their needs. A higher minimum wage is a 20th century solution to a 21st century problem. So what exactly should service industry workers, gig economy workers, and every other kind of worker be fighting for on Labor Day in the 21st century in a world of advancing technological unemployment and increasing financial instability? The right to say “No” to involuntary labor and “Yes” to machine labor. You may have heard of something being discussed more and more frequently. Its name is basic income. It goes by other names as well — names like a negative income tax or a citizen’s dividend. It could also be called the Individual Opportunity Grant, or simply a universal income floor. The name however does not matter so much as the idea, and the idea is simple. Every citizen should be freed from involuntary labor by leveraging our massive gains in productivity via technology to universally supply every citizen the means to unconditionally meet their most basic needs. Then, and only then, would selling one’s labor to others in the labor market become fully voluntary and all laborers finally welcome the loss of their jobs to advancing technology. It’s important to also not look at the flawed welfare system that exists today and see it as evidence that people won’t work without force. Our current system creates welfare traps where the removal of benefits as income rises results in little to no net gain. Would you work if you were living in poverty and a minimum wage job meant keeping fifteen cents for every dollar gained through your efforts? It is exactly this trap we need to remove by not clawing money back from people who are seen as no longer needing it badly enough. People work. People will always work. Even when half of our jobs have been entirely replaced by hardware and software at some point in the next 20 years, people will continue to work. The work will just be different and not necessarily involve monetary exchanges. We need not require anyone be involuntarily forced to work for work to be done. Perhaps you are now thinking this all makes sense, but where will the money come from? It will simply come from the share of productivity gains made possible by technology that should already be shared. Meanwhile, as automation continues, this surplus will only continue to increase. The argument can even be made that an unconditional basic income will actually save us money. Perhaps you are now thinking this all makes even more sense, but what of the jobs no one likes that need to be done, and can’t yet be done by robots? What about them? Unattractive jobs people don’t want to take, can and will always be made to become attractive by paying people enough for them to choose to do them voluntarily. There exists no job that won’t be done for the right price. So, for everyone with a job and everyone seeking one, as we today celebrate Labor Day and look forward to a growing new Labor Movement resurgence, instead of a higher mandated wage for an hour’s labor, let us all consider the alternative idea of fully voluntary labor and the ability to just walk away from jobs offering low pay and poor working conditions. Let us put aside notions that the other side must by definition always be wrong, and consider both the “conservative” idea that no one should be forced to pay another a minimum wage, and the “liberal” idea that no one should be forced to accept an unlivable minimum wage. This is the age of technological emancipation from labor itself. We need only actually embrace it. Without a basic income, today we celebrate Human Labor Day. With a basic income, tomorrow we celebrate Machine Labor Day. Special thanks to Steven Grimm, Arjun Banker, Topher Hunt, Stern Andrew, Keith Davis, Mark Witham, Albert Wenger, Larry Cohen, Joshua Grant, Chris Smothers, Danielle Texeira, Paul Wicks, Liane Gale, Jan Smole, Joe Esposito, Jack Wagner, Richard Just, Stuart Matthews, Natalie Foster, Chris McCoy, Michael Honey, Daniel Brockman, Gary Aranovich, Kai Wong, Peter Titus, Robby Olivam, John David Hodge, Louise Whitmore, Dan O’Sullivan, Robert F. Greene, Martin Jordo, Victor Lau, Shane Gordon, Paolo Narciso, Johan Grahn, Tony DeStefano, Andrew Henderson, Erhan Altay, Bryan Herdliska, Stephane Boisvert, Rise & Shine PAC, Kirk Israel, Luke Sampson, Lee Irving, Dave Shelton, Bryan Herdliska, Amy Shaffer, Tod Backe, all my other funders for their support, and my amazing partner, Katie Smith. If you liked this article, you can support it and future articles with a small patron pledge on Patreon. Scott Santens writes about basic income on his blog. You can also follow him here on Medium, on Twitter, on Facebook, or on Reddit where he is a moderator for the /r/BasicIncome community of over 29,000 subscribers.